This Situation Update gives a historical perspective on events occurring in Lu Thaw Township, Hpapun District since 1992, which continue to affect villagers in 2016, including military activities, militarisation, Tatmadaw attacks on villagers, civilians being shot on sight, killings, IDPs, food shortages, civilians’ livelihoods, education and health. Since the Tatmadaw attacked villagers in Htee Moo Khee area, Lu Thaw Township in the years prior to 2016, civilians fled for their lives, leaving behind their lands and all of their belongings; they have not been able to return to their own villages yet. Significant human rights abuses happened in Lu Thaw Township around 1997 because villagers were threatened by the Tatmadaw frequently. Tatmadaw Light Infantry Battalion [LIB] #77 attacked villagers and children. They shot villagers on sight, killed their animals, burned villagers’ houses, schools and rice barns. Displaced civilians and children faced food shortages whilst they were in their hiding places in the jungle. Some civilians fled to refugee camps in Thailand. Children could not access medicine, medical healthcare and education because teachers and students were separated from each other and there was no medicine for them when they fled the Tatmadaw. There were very few students who got a chance to go to school and they had to study in fear in the jungle. After the Karen National Union [KNU] signed the 2012 preliminary ceasefire agreement with the Burma/Myanmar government, the Tatmadaw has not withdrawn from any of their army camps in Lu Thaw Township. Access to health and education in recent years has improved because civilians no longer have to flee. The following Situation Update was received by KHRG in January 2017. It was written by a community member in Hpapun District who has been trained by KHRG to monitor human rights conditions. It is presented below translated exactly as originally written, save for minor edits for clarity and security. This report was received along with other information from Hpapun District, including 35 photographs. Since the Tatmadaw attacked Htee Moo Khee area, Lu Thaw Township, Hpapun District in 1992, villagers had to leave [flee] their villages and their farms that they worked on. In 1997, Tatmadaw Light Infantry Division #77 attacked the whole of Lu Thaw Township area so villagers were displaced into the jungle and some villagers fled to refugee camps in Thailand. This fighting caused a large number of human rights abuses in Lu Thaw Township and the highest number of villagers were killed [in 1997] by Tatmadaw LID #77. The Tatmadaw did not shoot [attack] only the Karen National Liberation Army [KNLA], they also shot villagers, including children and whoever else they met. Villagers were killed by the Tatmadaw’s gunfire almost every day [in 1997]. The villagers could not bring enough food with them when they were fleeing their villages. Therefore, when their food was gone, they had to return to their villages to get food. Unfortunately, the Tatmadaw saw them and then killed them with their guns. The Tatmadaw army shot on sight any villagers and whoever else they met. They also killed villagers who displaced [hid] in the jungle when they saw them, although some villagers escaped [before they were seen]. Wherever they [the Tatmadaw] arrived, they burnt down a lot of houses and rice barn in the villages. They killed villagers’ animals such as cows, buffalos, pigs, chicken and goats. Displaced villagers who hid in the jungle faced food shortages; they did not have rice to eat so they had to find fruits and vegetables from the jungle such as young rattan plant, wild young banana plant and wild yam in the jungle. Therefore, some displaced people had to flee to the refugee camp in Thailand. Some displaced villagers who were left in the jungle still had to face starvation and they struggled to survive and overcome difficulties. Some villagers’ rice barns [that they hid in the forest], were not seen by the Tatmadaw but they had to go back and get their paddy whilst in danger [of being seen by the Tatmadaw]. They had to separate themselves into groups so that one group would check the way back to their rice barns in secrecy in order for their security and then they could get their rice in darkness at night time. Then they shared the paddy that they got [from their hidden paddies] with each other. They had to cook porridge with young rattan plants and other vegetables [because they had little rice] so that they would be able to survive. In the rainy reason, they cooked porridge with bamboo shoots. They had to look for wild yams during the wild yam period [in the winter]. When villagers prepared their hill farms to plant paddies; cleaning the grass and other vegetation in the hill farms during harvesting time, some villagers had to check the road [for security] and some of them had to work on the farm. The security guards had to fire a musket for the signal when they saw Tatmadaw. Then the other villagers who worked on the farms were able to hear the warning signal and then they would know that the Burmese army was approaching. Therefore they could run back to their hiding place. [At that time] there were very few KNLA soldiers therefore they could not cover [provide] security for the villagers in every place. Therefore, the villagers and Karen soldiers [KNLA] always had to cooperate in [matters of] security by guarding and keeping eyes on the Burmese army [Tatmadaw] as they will be able to work [on farms] for their livelihoods. We could go through [stay alive] year by year because the KNLA soldiers have provided security. The Burmese military [Tatmadaw] set up their army camps in villagers’ areas and the hill farms of Lu Thaw Township area. They [Tatmadaw] patrolled in Lu Thaw Township area and they were always looking for villagers to kill, and shot villagers on sight so that the Karen people from this area would leave. 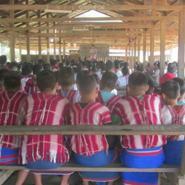 Therefore, the villagers had to cooperate with Karen soldiers [KNLA] for their security and safety. In 2006, villagers [from Lu Thaw Township] organised home guard groups for their security when they work on farms for their livelihoods and they [those people] would keep their eyes on the Tatmadaw. “If the Burma/Myanmar government is committed to adhering to the peace process with the Karen National Union [KNU] government, they might withdraw their army and army camps from the KNU controlled area. [As] they have not withdrawn their army [and army camp] we are afraid to trust them”. In 1992, there were some schools in Lu Thaw Township for the children to study but most of the schools were organised by religious leaders and the villagers. Students’ parents and religious leaders provided the teachers’ salary. Students’ parents had to provide food for the teachers and then they had to buy school stationery for their children. Therefore, some parents could not afford to support their children to go to school. In 1997, Tatmadaw LID #77 attacked [villagers in] Mu Traw [Hpapun] District so some villagers displaced into the jungle and some schools were burnt down by the Tatmadaw. Some schools had to stop [close] because the teachers and students fled to different places meaning they were separated from each other. Some [children] studied in the jungle. 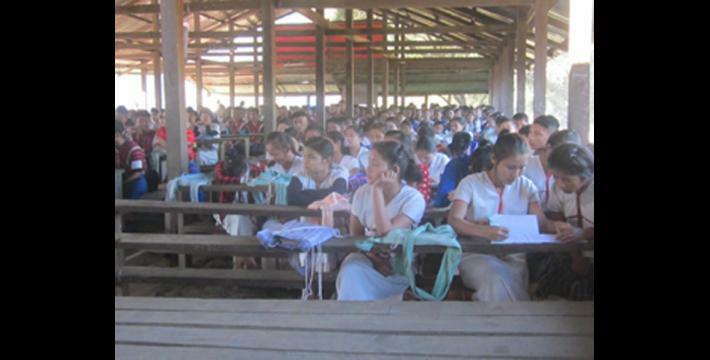 In 2000, Karen Teacher Working Group [KTWG] entered into cooperation with the Karen Education Department [KED] in Mu Traw District and provided some teachers’ salary and free school stationery to the students. Therefore, the student numbers increased because the children whose parents could not afford to send them to school could [now] go to school [after the KTWG and the KED provided support]. They still had to study in fear because fighting still happened [between Tatmadaw and KNLA] in their area. 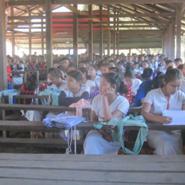 Villagers fled into the jungle and the students had to study in the jungle when the Tatmadaw army came to their villages. They returned to their villages when the Tatmadaw left the villages. They always had to flee to the jungle when the Tatmadaw army came and then they returned when the Tatmadaw army left. After the KNU singed [the 2012 preliminary] ceasefire agreement with the Burma/Myanmar government, the fighting did not happen, therefore the students could study well and they did not have to be afraid [of Tatmadaw]. 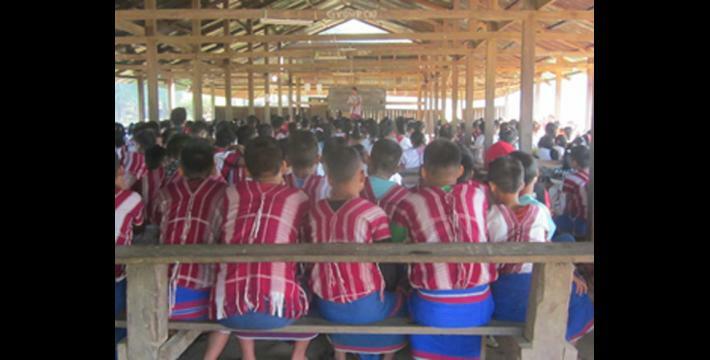 We know that the number of the students [in Hpapun District] is increasing gradually. Most of the children [in Hpapun District] nowadays go to school because their parents [in Hpapun District] are enthusiastic about sending them to school. Furthermore, after 2012 many non-governmental organisations have entered into our area and are empowering and encouraging the children’s education so that children [in Hpapun District] are enthusiastic to study. Most young people are looking for education because they know that education is the most important thing to them in their life. In 1992, there was only one clinic in Lu Taw Township, Mu Traw [Hpapun] District. This clinic was located in P’Nah Aay Per Hkoh village. Lu Thaw Township is very big and there are a lot of mountains so people who lived far from the clinic could not reach the clinic. Therefore, they had to use the same herbal medicine that their great grand-parents used to use [to treat themselves in cases of sickness]. In 2000, KNU Health Department [KDHW] cooperated with a group of NGOs working on health that started setting up more clinics in each village tract [in Lu Thaw Township]. They selected more health workers and gave annual medical training to the [new] health workers so that the strengths [numbers and knowledge] of the health workers increase. Between 2006 and 2007, the KNU Health Department cooperated with a group of NGOs working on health issues and finished setting up one clinic for each village tract [Lu Thaw Township]. They sent one small group of Backpack Health Workers (BPHWT) to be based in each village tract that did not have a clinic. In 2016, a health organisation set up more malaria testing facilities, expanded research and built more buildings for malaria tests [research] in each village in Hpapun District. There is one village level malaria test health worker per village who has to submit a weekly report note to the clinic. Health workers try their best regarding health in Lu Thaw Township so that public health situation in Lu Thaw Township is getting better. If there is any serious illnesses which happens to the villagers that they could not treat, they send the patients to hospital in Thailand or [a hospital elsewhere in] Burma/Myanmar. This Situation Update was written as part of KHRG’s 25 year anniversary review in 2017, summarising human rights trends since KHRG’s formation in 1992. This update is based on a KHRG community member’s account of the situation and, due to the lack of detailed record keeping at this time, specific dates may not be verifiable. Light Infantry Division (LID) of the Tatmadaw is commanded by a brigadier general, and consists of ten light infantry battalions specially trained in counter-insurgency, jungle warfare, search and destroy operations against ethnic insurgents. They were first incorporated into the Tatmadaw in 1966. LIDs are organised under three Tactical Operations Commands, commanded by a colonel, three battalions each and one reserve, one field artillery battalion, one armoured squadron and other support units. Each division is directly under the command of the Chief of Staff (Army). While the report details with events occurring in 2016, the researcher sent a photo taken in 2017 for further information. This is likely to refer to Shoklo Malaria Research Unit who have been running a number of malarial clinics in Karen State. However more specific information and confirmation is currently unavailable.